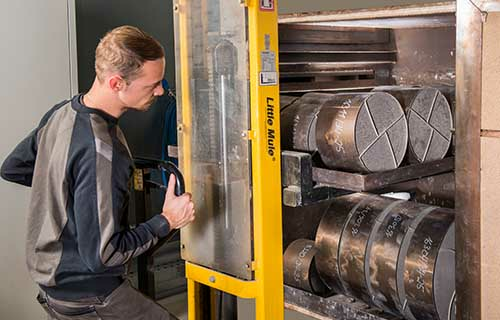 At the Ramsloh site (near Oldenburg), the company has extensive CAD and CFD workstations and test facilities to develop, test and produce new catalysts for customer applications. Emission Partner manufactures each catalyst 100% in-house and is therefore not dependent on any pre-suppliers. This is particularly advantageous for custom-made products according to customer requirements. From the drawing, through the production of the metal carrier and the coating of the catalysts and the subsequent metal processing, all production steps are carried out in our own company. This leads to short delivery times, high product quality and a long service life. Our technical sales staff work closely with customers to find the best solution for compliance with legal limits. In Germany, we have competent technical contacts in Hanover, Münster, Leipzig, Munich and Regensburg who will work with you to find the best technical emissions solution for your engine.. 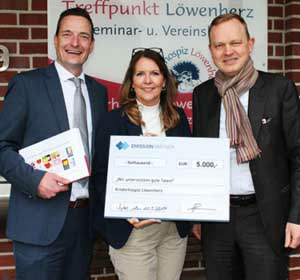 Emission Partner supports good deeds - Löwenherz children's hospice! Also this year the company Emission Partner GmbH & Co. KG donated € 5,000 to the Löwenherz children's hospice in Syke. https://emission-partner.de/wp-content/uploads/2019/03/News_Loewenherz-2019.png 350 375 Emission Partner https://emission-partner.de/wp-content/uploads/2018/04/Emission-Partner-Logo_BML_RGB.jpg Emission Partner2019-04-05 09:53:162019-04-05 09:59:46Emission Partner supports good deeds - Löwenherz children's hospice! Would you like to get to know us? – Let’s go!